Red Flag Warning now in effect for saturday for very low humidities and strong gusty northeast to east winds. THE NATIONAL WEATHER SERVICE IN SAN DIEGO HAS ISSUED A RED FLAG WARNING FOR STRONG GUSTY WINDS AND LOW HUMIDITIES WHICH IS IN EFFECT FROM 2 AM TO 6 PM PST SATURDAY. A COMBINATION OF STRONG WINDS, LOW RELATIVE HUMIDITY AND WARM TEMPERATURES WILL CREATE EXPLOSIVE FIRE GROWTH POTENTIAL. DISCUSSION: SURFACE HIGH PRESSURE OVER THE GREAT BASIN AND UPPER LEVEL HIGH PRESSURE RIDGE OVER THE CALIFORNIA COAST WILL BRING WARMER... DRY... AND WINDY WEATHER THROUGH SATURDAY. CONTINUED WARM AND VERY DRY FOR SUNDAY. RECENT RAINFALL AND THE IMPACT ON FUELS WILL BE A MITIGATING FACTOR BUT GIVEN THE STRENGTH OF THE WINDS AND THE VERY DRY CONDITIONS ANY LARGE FIRE STARTS COULD RESULT IN RAPID FIRE GROWTH. THE WINDS WILL DIMINISH SATURDAY AFTERNOON BUT POOR OVERNIGHT RECOVERY IS EXPECTED SATURDAY NIGHT WITH VERY LOW HUMIDITIES BUT WEAK WINDS FOR SUNDAY. WINDS: NORTHEAST 20 TO 30 MPH WITH GUSTS TO 55 MPH. GUSTS TO 65 MPH ARE POSSIBLE IN THE FAVORED LOCATIONS. TIMING: NORTHEAST WINDS ARE INCREASING THIS MORNING AND WILL CONTINUE AT TIMES THROUGH SATURDAY AFTERNOON. LOWEST HUMIDITIES ARE EXPECTED SATURDAY. OUTLOOK: THE WINDS WILL WEAKEN RAPIDLY SATURDAY EVENING BUT POOR HUMIDITY RECOVERY IS EXPECTED SATURDAY NIGHT WITH VERY DRY CONDITIONS CONTINUING INTO SUNDAY. 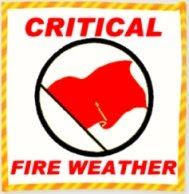 INSTRUCTION: A RED FLAG WARNING MEANS THAT CRITICAL FIRE WEATHER CONDITIONS ARE EITHER OCCURRING NOW OR WILL SHORTLY.